I just saw the Lincoln movie and after Daniel Day-Lewis won for best actor. Just had to added this Lincoln and Tad at a sale price at www.statue.com. This replica is just one of our large collection of Lincoln statues we offer, we have Lincoln busts, Lincoln Life Masks, replicas of his hand, Young Lincoln bust and many other collectables of Lincoln statuary. Lincoln and Tad Sculpture by David Frech. 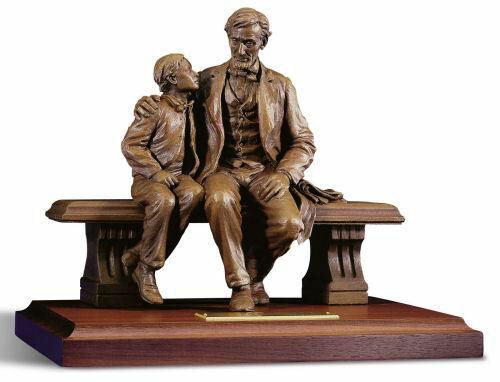 This reproduction of Abraham Lincoln and his son, Tad, is by the by David Frech. The United States Historical Society commissioned the bronze life-sized statue and donated it to the National Park Service. It is located at the Tredegar site of the Civil War Visitor Center in Richmond, Virginia, where the President came in peace “to bind up the nation’s wounds” at the end of the Civil War. Lincoln scholars, historians, and art critics are equally enthusiastic about the statue of Abraham Lincoln in the Capital of the Confederacy. Made in the USA. Plaque states: Abraham Lincoln and Tad, Richmond, VA, April 5, 1865.